Melba's Chocolate Factory is a 'working' tourism factory located in a heritage listed complex at Woodside in the Adelaide Hills. In 1990 the current proprietors arrived armed with 1940's era chocolate and confectionery making equipment. They began their dream making old Australian favourite chocolate and confectionery. The complex developed from there and is now known as 'Heritage Park' and has become home to other cottage industries. 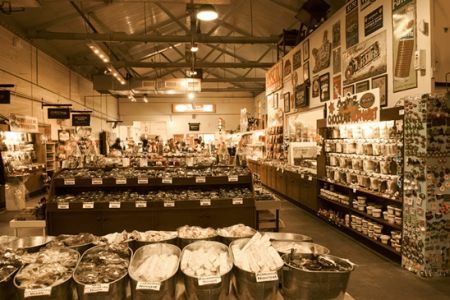 Visitors today find the old cheese factory transformed into a large emporium styled confectionery factory shop. This is a centerpiece for 5 different rooms, where various manufacturing processes can be viewed. These are the chocolate room, depositing room, packing room, panning room and toffee room. Visitors are encouraged to speak to the staff who have mastered the use of the heritage equipment, making old fashioned favourites in the time honoured tradition. Old favourites such as Inch Licorice Block, Traffic Lights and Rocky Road. To tempt chocolate lovers, there is the constant aroma of chocolate and confectionery being made.....yum! All in all, this package makes the factory a popular family attraction as well as a significant Hill's destination for families, groups, charters and interstate, national and international visitors. Melba’s Chocolates was started by Graeme and Joy Foristal in March 1981 in a small wash house behind their Adelaide Restaurant, ‘Melba’s’! The business progressed in varying stages and with the restaurant sale, was relocated to a single car garage behind their Oakbank home. July 1st 1990 Melba’s transferred to this historic Woodside Farmers Union Factory site which had closed in 1977 and been left to languish. Melba’s took over the former cheese factory building. The mammoth task of cleaning the old site commenced. Fourteen years of abandon and neglect were washed away – Stage 1 of Heritage Park had commenced.